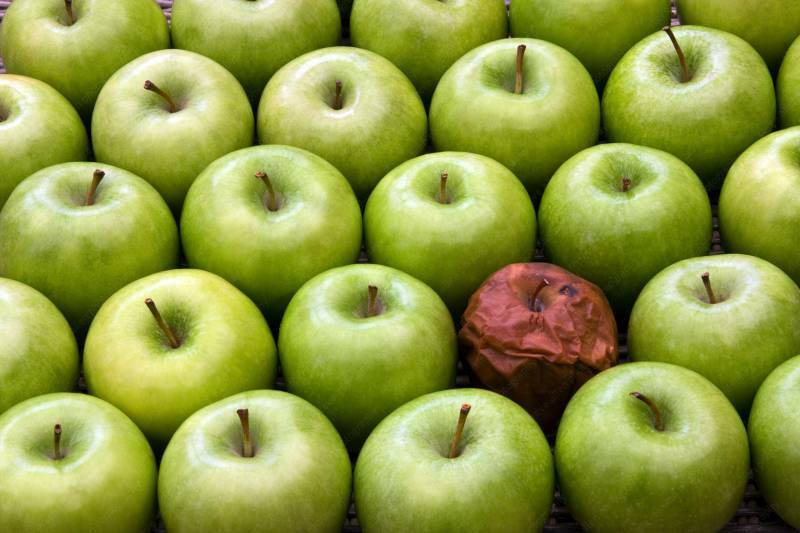 What Is the Significance of Being a Bad Apple? Over the last three years or so, I’ve noticed a strange quirk in the debates over police brutality in the United States. Proponents of the police often couch their support in an analogy, which they intend to mean, “Some police officers do bad things, but in general, they are good and do good and shouldn’t all be dismissed as bad simply because some of them are bad.” They mention something about “a few bad apples,” normally without completing the sentence, which makes evaluating the origin of the analogy more difficult. This has always confused me, because the analogy associated with that phrase is (or was), “A bad apple spoils the whole bushel” – which would, therefore, mean that if a few police officers are “bad apples,” they would contaminate all of their colleagues by association. In other words, those who invoke the phrase “a few bad apples” to defend the bad actions of a few bad individuals within an organization are, ironically, invoking an analogy that directly undermines their claim because it means the exact opposite of what they think that it means. So when did this analogy on “a few bad apples” completely shift toward the exact opposite of what it means? As to this specific example, I know not, though NPR speculated on this bizarre tend in 2015. However, I see the inversion of meaning of this particular idiom as part of a larger trend. I suspect that the inversion, or subversion, of the meaning of this analogy, “One bad apple spoils the whole bushel” stems from this new-found aversion to making any kind of generalization at all. Statistically validated generalizations are mean, or they run the risk of treading upon various -isms or -phobias. In public discourse today, general propositions (based on the balance of probabilities, where something is probably true, but not definitively so in every single instance) are often conflated with universal propositions, in which the conclusion must be true in all cases if the premises are true. Contrary to popular belief, if you identify an exception to a generalization, you have not necessarily disproven the generalization. The sorts of people who constantly denounce all generalizations as hasty would be the same who could drive around with a bumpersticker saying, “All generalizations are false” without any sense of irony. Canadians and Americans tend to emphasize the “economic” in “socio-economic” class, whereas Britons are more likely to consider both, the economic and cultural factors. In the British sense of the phrase, “middle class” means living comfortably, usually in the context of business-owners and professionals like doctors, lawyers, and engineers, and now increasingly all salaried civil servants. Being middle class could also refer, more generally, to annual household income, which means that the actual numbers would fluctuate (and, hopefully, increase overall) over time. Statistics Canada categories income into quintiles, which would mean that the second quintile equals “lower-middle class”; the third, the middle of the middle class; the fourth, “upper-middle class.” And, in fact, all quintiles have made gains in wealth in Canada since the late 1990s, and the share of wealth held by each quintile has also remained steady, with little change between 1999 and 2012. (So please remember, Canadian readers, that the American narratives on income equality and stagnating or decreasing household incomes do not apply here in Canada, where our data show something entirely better and different). Under either definition, if you are truly struggling to make ends meet, then you are not really part of the middle class. In 2016, The Atlantic published an article entitled, “The Secret Shame of Middle-Class Americans,” which refers to a study finding that most Americans cannot spare $400 out of their monthly budget for an emergency. In reality, if you can’t spare $400 for an emergency (like having to book an unplanned airline ticket or paying for automotive repairs), then you are not part of the middle class at all — the true “secret shame of middle-class Americans.” But they would consider acknowledging their financial precariousness as shameful, especially if they brought it about by over-extending themselves with unnecessarily large cars and houses. Everyone wants to call themselves “middle class” because the phrase, now divorced from any objective meaning, has become a shorthand for economic aspirations of upward mobility. Only the “middle class” can fully participate in the civic life of the polity. This desire to universalize the “middle class” stems from ultra-egalitarianism and a tradition of Aristotelian civic republicanism, where everyone who participates in the polity ought to own some small amount of property. But if everyone is middle class, then no one is middle class, and the term loses all meaning. Prime Minister Trudeau II incessantly talks about “the middle class” because he knows that most Canadians think of themselves as middle class, and if he convinces them that he cares about their concerns, then he can potentially win the Liberal Party the support of a majority of the electorate. Furthermore, if everyone is middle class, and the Liberal Party of Canada cares about the middle class, then the Liberal Party of Canada cares about everyone and is also the most Canadian party of them all; by extension, the New Democrats and the Conservatives are less fully Canadian and care about Canadians less. In short, the meaning of words matters, and most attempts to change the meaning of words are, ultimately, about making plain things more difficult to understand.